Fermenting the salsa longer than this would have reduced the chunkiness of the salsa, moving it more toward sauce, and I wanted chunky salsa. I crushed a couple cloves of garlic, sliced a few scallions, and chopped a handful of fresh chervil, and stirred these ingredients into the salsa, in addition to some fermented hot sauce for heat. I then let it sit in the fridge a day before I enjoyed it. It’s bubbly, zingy on the tongue, and very delicious. This entry was posted in Uncategorized by Favero Greenforest. Bookmark the permalink. so you don’t have to buy a starter? It will just happen? 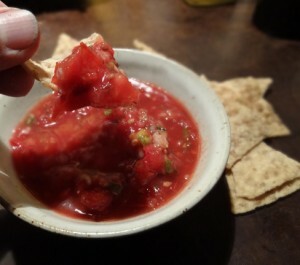 I made some salsa using Nourishing Traditions recipe with the added salt and no whey. After a week on the counter, not one bubble. ??? I just put in in the fridge, but haven’t decided if it’s edible or not. The only variable I can determine is that I used Roma tomatoes from the grocery store instead of homegrown. In the past I’ve made it and within 48 hours it was producing bubbles and that’s when I put it in the fridge. Taste it. You can know at once if it’s fermenting, bubbles or not. 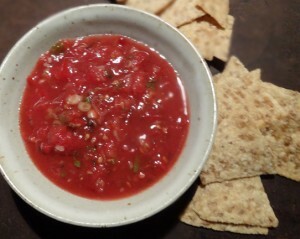 I made about 3 cups of salsa and added two large pinches of sea salt equaling about one teaspoon. Is that enough salt for the quantity of salsa? Secondly, I puréed half of the tomatoes and rough chopped the rest, do I need a layer of liquid to cover the top of the exposed salsa in the jar? Thanks! Taste the salsa and you’ll know if the salt level is right. Submerged or not, mold will likely grow on top. If the solid tomatoes are submerged, it’s easier to pour off the mold with some of the liquid (or extract with a turkey baster). Or, just scrape it off with a spoon. >I stirred 2 or 3 times daily so the common mold that easily forms on fermenting tomatoes couldn’t get organized sufficient to colonize the top of the ferment. Nice idea. Big like and many thanks.